This is #10 of my Top Ten of 2014! -Rite Publishing: Steve, you gave me my first complimentary copy. I probably wouldn’t be reviewing without you and most Rite Publishing books still tend to land on my “must play”-pile. Love your work both as a publisher and writer. Also: Thank you for the spot in Pathways! -Rogue Genius Games: Owen’s company taught me *A LOT* about good crunch, ingenious design, etc. I have no other 3pp that has so many allowed PC-classes in my main campaign. That and talented classes rock my world. Also: Owen, thank you for your professionalism. -Frog God Games: You people are not only professional and nice, you keep on creating the awesome, big and gorgeous mega-tomes I want. It goes without saying that I’m extremely happy about all of them. When I read the “thank you”-shout out in Slumbering Tsar back in the day, I teared up a little. Also: YOU MADE RAZOR COAST HAPPEN. Thank you. 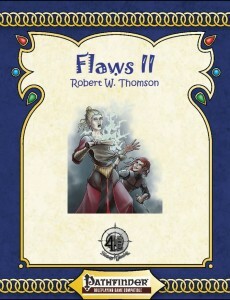 -Raging Swan Press: When I’m burned out on crunch, when I don’t want to read anotehr module, I turn to Raging Swan Press – no other 3pp has made my DMing so much better and easier. Although I still have to translate the tables, villages etc. on the fly, the go-play aspect of your stuff is awesome. The Dressing-books changed my whole DM-style for the better. I salute you folks. -TPK Games: Thank you for providing the crit-system I know and love as well as gritty, dark fantasy goodness. I’d also like to thank you guys for allowing my insane designs within your book. -Interjection Games: Thank you for making some of the most beloved base classes at my table – without them, our game would be poorer. Also: Thank you for making me a part of the design-team for Strange Magic from the get-go. I learned *a lot* about complex class design and work has been an awesome experience. -Purple Duck Games: Thank you for making some of the coolest, most underrated classes and supplements out there and for making legendary items work properly. Also: Thank you so much for introducing me to Daniel J. Bishop’s superb work! -Legendary Games: Thank you for all the great plug-ins, for making mass combat as deep and rewarding as it is and for providing all the mythic rules I need! -Dreamscarred Press: Thank you for psionics and being class acts, even in the face of diverging opinions. I look forward to seeing what you create in the future! -Radiance House/Everyman Gaming: Thank you for Pact Magic – without it, my games would be so much poorer. -Kobold Press: Thank you for making Midgard and providing source-books that breathe this tangible spirit of the fantastic! -LPJr Design: Thank you for making gorgeous, inspired and downright weird pdfs; I find my campaigns enriched by the cool ideas you bring to the game. -Little Red Goblin Games: Thank you for providing my “And now for something completely different”-setting, Necropunk. I love what you have done and achieved there! -Forest Guardian Press: Morgan, thank you for the Direlock – it’s my favorite gish-class and sees *A LOT* of use at my table! Your Savage will join ranks here, I presume. -Misfit Studios: Thank you for making me a part of Bite Me! back in the day! -Mór Studios: Thank you for making a surprisingly captivating saga so far; I’m looking forward to seeing where this goes! But most of all, more so even than to thank all the authors and publishers, many of whom I’d call friends, I want to thank YOU. Yes, you. The person sitting in front of a screen, clicking on reviews. The guys and gals who read my ramblings. I want to thank all of you who dropped me a comment at one time or another, telling me I made a difference. You can’t fathom how much that means to me, how often it has elevated me from a place of doubt back to high spirits. And when the rare complete stranger surprises me with a random act of kindness with a donation of a file, a book, or just plain money, that is when I realize I have much to be thankful for – and it is all due to you. I also want to thank everyone who has corrected one of my mistakes in the past – I’m not perfect, but you ladies and gentlemen help me on my continuous quest of self-improvement. So thank you. As per the writing of this post, my official review-counter stands at 1750 reviews. To anyone who has ever read even ONE of them, even if you disagreed with me and consider me a doucheback – thank you for your time. Have a wonderful day and see you, hopefully, tomorrow, with 3 new reviews! This alternate class clocks in at 17 pages, 1 page front cover, 1 page editorial, 1 page SRD, leaving us with 14 pages of content, so let’s take a look, shall we? No the terminology might be considered a problem from the get-go – the word “Savage” constitutes more than a direct opposition to “civilized men.” Hence, the 1st page is devoted to an explanation that acknowledges that this pdf is not based on any real life cultures -I applaud this maturity. If you’re interested in the genesis of the development and meanings associated with this particular dichotomy, feel free to drop me a line. The Savage class is an alternate class for both barbarian and monk, meaning that multiclassing into either is prohibited. The class receives d12, 6+Int skills per level, proficiency with axes and generally, stone age-style weapons – a comprehensive guideline for savage weapons and armors would be included here, allowing for further, campaign world specific customizations of proficiencies. When wearing medium or heavy armor, the savage loses both fast movement, furious blows and the AC-bonus. 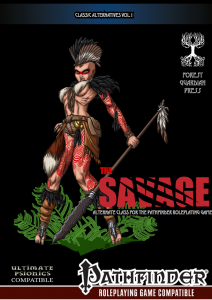 It should also be noted that the savage can add two skills of their choice as tribal lore to their array of class skills. The class also receives full BAB-progression, good fort and ref-saves, an AC (and CMD! )-bonus scaling up to +5 and increased movement rate scaling up to +60 ft. What are furious blows? Well, at first level, the savage can execute +1 attack, imposing a -2 penalty to all attacks. These scale upwards at 8th and 15th level and these attacks may only be executed with savage weapons. Interestingly, the ability manages to get two-weapon fighting rules-interaction right – there is none this time around and this is good in this case – the ability is rather powerful, though thankfully, certain massive weapons have an additional penalty applied. Now the savage may also enter a primal state as a full-round action that provokes AoOs. Said state can be maintained up to 24 hours and provides +2 to Intimidate, Handle Animals and Sense Motive skill checks and Improved Unarmed Strike as a feat, which also works for the purposes of feat-prerequisites – nice catch! Additionally, the state can be expended to power abilities and feats, somewhat akin to how psionic foci work – the lists of feats/powers contain the necessary information for which needs the expenditure. Instead of a rage, savages may enter so-called rampages for up to 4+con-mod rounds per day, +2 per additional class level. While in a rampage, savages receive +2 to will-saves, acrobatics, climb and swim-checks. Now rampage also offers temporary hit points equal to foe’s HD for every enemy reduced to 0 hit points or below – surprisingly, the ability comes absolutely kitten-proof – no way to abuse this! Gloriously done! Now the next thing would be a bit complex, so bear with me – savages of 2nd level (and every even level thereafter) may select a monk’s bonus feat or a barbarian rage power as a savage power, though the latter only work while rampaging. Evasion and improved evasion may be chosen as well, the latter thankfully with a level-cap. A massive list of rage powers from core, APG and UC are provided and yes, the pdf is smart enough to prevent combinations of different totem rage powers. The class also receives uncanny dodge at 2nd level (improved at 5th) and a scaling danger sense that translates to a bonus to initiative and a bonus to AC when being attacked by ranged weapons in the surprise round – nice spider-sense! Savages also receive scaling bonuses versus diseases and poisons that turn to immunity at very high levels. At 4th level, the savage receives a pool of feral points equal to 1/2 class level +con-mod. As long as the pool contains at least 1 point, rampaging savages may have weapons count as magic for DR-purposes and at 9th level, also as cold iron/silver. When in primal state, a savage may expend 1 point from the feral pool as a swift action to increase movement by 20 ft for 1 round, +2 natural AC for 1 round, +20 (!!!) acrobatics for jumping purposes only or +1 to critical confirmation rolls for con-mod rounds. Additionally, 4th level savages may expend feral points to quickly heal non-lethal damage or diminish the duration of some negative conditions. 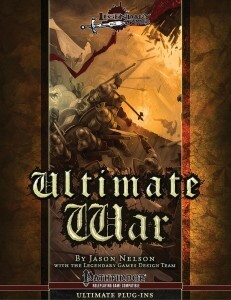 At 11th level, savages receive ferocity and the truly high-level savages may enter blood rages. The capstone makes the savage tougher and makes criting them very hard – but this is not where we stop; This pdf also provides quite a few archetypes, first of which would be the Dread Savage. Instead of entering a primal state, these guys may enter a kind of death-like trance that has them count as undead, but still allows them to be healed by positive energy – provided they succeed a concentration-check. Their rampage allows them to render targets hit by their wight strikes shaken, allowing the dread savage to expend rounds of rage for additional slam attacks (no synergy with furious blows, though) and the archetype also receives a debuff aura , increased saves versus level-drain etc. The dread pool the archetype has, also allows for wholly unique benefits and 3 new rage powers complement the package. The second archetype would be the Noble Savage – noble savages receive an unleashed presence in lieu of rampaging, use their cha-mod to determine their pool and may expend said points to grant themselves cha-mod as bonus to saves for 1 round. It should be mentioned that the presence has the bonuses applied to completely social skills and that it’s governed by cha as well. Almost perfect negotiators, they can grant themselves massive bonuses to bluff, but thankfully not for feinting purposes. Next up would be a special treat with the phrenic savage alternate class, a psionic alternative to the base savage – these guys receive changed save-progressions, a limited array of power points (scaling from 1 to 70), governed by wisdom. The phrenic savage also receives unlocked talent and a pretty limited array of psionic tricks thus, later learning to use wis to govern it instead of cha. Phrenic savages may expend power points to temporarily grant them rapid metabolism and similar feats, including a kind of DR versus ability score reduction (somewhat unfortunately named “ability”, making it slightly more opaque than it should be). The improved fiery discorporation capstone at 20th level is also rather nice, though the phrenic savage pays for the psionic tricks with both the flurry-like trick and the rampages. Still, would have loved the class to mention for what it is an alternate class – I *assume* full multiclassing potential, but I’m pretty sure the class probably ought to have some limit. The 4 psionic feats used by the alternate class and the two psionic powers are provided in here as well. We also receive a final page of primitive weapons, courtesy of Little Red Goblin Games, ranging from the great macuahuitl to the gunstock club – these are all solid. Editing and formatting are very good – while, in some instances, wording is slightly less precise than I would have wanted it to be, over all, the pdf manages to handle the complex content rather well. Minor issues like the “st/nd/rd/th” missing behind the numbers in the class level table of the Phrenic Savage can be considered generally cosmetic. The pdf comes with glorious, original full-color pieces of art and the 2-column b/w-standard generally is printer-friendly. The pdf comes fully bookmarked for your convenience. Morgan Boehringer (lead developer), with Jim Wettstein (and additional content by Keil Hubert and Christos Gurd), just delivers. There’s no way around it, the savage may be the most interesting melee-base-class I’ve seen in quite a while – it is powerful and I was honestly surprised that it fared so well in playtest and turned out to be rather well-balanced. This is honestly the level of awesomeness I would have expected from each and every ACG-class. The savage has more options than either monk or barbarian, without invalidating the parent classes. The additional content just represents the icing on the cake. The psionic variant class is also solid, though it feels slightly less inspired – mainly because the class does not have that many tricks up its sleeve – the unlocked talent route does not necessarily provide a selection of powers to use, which the pdf seems to imply. Unlocked Talents nets the phrenic savage exactly ONE power, which is prescribed by the pdf. Why not provide at least a slight array of e.g. psychometabolism choices? The psionic savage is simply not half as interesting and flexible as the base class and thus, would be one of my minor complaints. Another minor issue would be the 19th level of the savage class, which is a dead level. Now are these minor issues? Yes. Is the overall class AWESOME? HECK YEAH! The savage constitutes a damn cool addition to any kind of group, is fluff-wise easily implemented, complex, yet easy to grasp and would be 5 stars + seal of approval were it not for aforementioned minor glitches. With the slight imperfections, which in no way spoil this otherwise damn cool class, I will instead settle “only” for a final verdict of 5 stars. Consider this the monk/barbarian-class the ACG should have delivered, but didn’t. 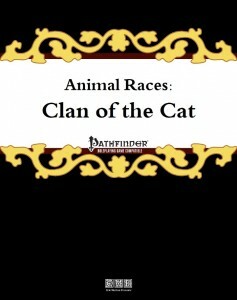 You can get this damn cool class here on OBS and here on d20pfsrd.com’s shop! 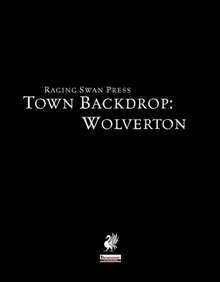 This first installment of Raging Swan Press’ Subterranean Enclave-series clocks in at 10 pages, 1 page front cover, 1 page advertisement, 1 page editorial/ToC, 1 page SRD and 1 page back cover, leaving us with 5 pages of content, so let’s take a look! In Severed Umbra, now once again opened and a vibrant trading spot with the realms below, regular folk coexist with the enigmatic dark folk, having adopted their mannerisms and habit of dressing. Surrounding a lake that is the home to weird phosphorescent fish makes for a cool general location and the village is also sporting a place where lizards are cultivated for their meat as well as a dark rag outfitter, psychotropic shroom addicts, a psychotic halfling evoker ( level 9, fully statted) and a fully statted dark stalker co-leader of the town. Beyond these obvious hooks, acclimatization to the dark and actually kind dark stalker healers (!!!) make for further odd, yet pleasant peculiarities. Better yet, aforementioned sample events prove to be pretty helpful in driving home the special considerations a place like this requires. 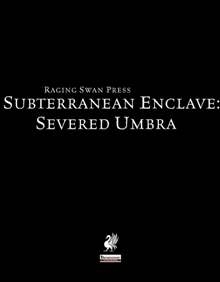 I couldn’t have imagined a more suitable writer to kick off the new series – Mike Welham’s Severed Umbra is delightfully unconventional and distinct, with more hooks than you’d imagine to find in the pages of such a supplement – possibly even enough to base a whole campaign on this camp of former outcasts, forged together into an unlikely unity. The one problem I see with this pdf is that it sets a very high standard for the whole series and the pdfs to come – I hope other authors can match this cool locale. My final verdict will clock in at 5 stars + seal of approval for a great place indeed! 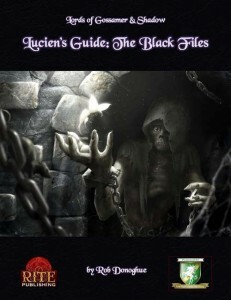 You can get this awesome underworld enclave here on OBS and here on d20pfsrd.com’s shop! This pdf clocks in at 11 pages of content, 1 page front cover, 1 page editorial, 1 page SRD, leaving us with 8 pages of content, so let’s take a look, shall we? A total of 7 new edges are provided – which sounds like not much. Well, they cover pages 2 -5: What I’m trying to say is – they are LONG. A total of 16 companion tricks, from trample to grab etc. – all those NASTY monster qualities, are for example part of the tricks! Or what about more hunter’s tricks like one that prevents AoOs from spells or spell-like abilities? What about upgrading movement to flying, but with the caveat that you have to end your movement on solid ground or fall – WuXia-rangers, anyone? Oh, and fighter feats. Yeah. A total of 13 new talents are also provided – including unnatural auras, a revenge smite for killing animal companions, fast stealth in the right terrain, etc. 5 new advanced talents, allow you to make overland chases hard for your enemies (Yeah! ), see through plant matter and even using level-checks to temporarily disable abilities of favored enemies. We also receive a massive 8 new Grand Talents – restoring favored allies from the dead, adding the advanced template to animal companions, free withdraws after hitting foes for ultimate skirmishing… the options are deadly and nasty indeed! 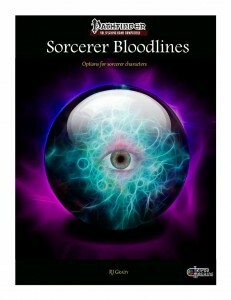 Or want to make your spells supernatural? There you go! The final page groups the talents by theme and does something awesome – it provides advice for using Rogue Genius Games Ranger’s Knacks and the talents of Kobold Press’ Spell-less Ranger. Nice shout-out and cool to see! Editing and formatting are top-notch, I noticed no glitches. Layout adheres to Rogue Genius Games’ two-column full-color standard and the pdf comes with nice stock art. The pdf comes fully bookmarked with nested bookmarks for your convenience. 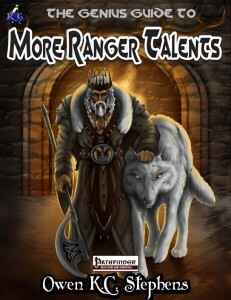 The options provided in this expansion of the talented ranger are powerful – some of the animal tricks, especially when taken out of context, can result in really nasty tricks and the same goes for some of the other options herein – so yes, imho this is a power-level upgrade for the Talented Ranger. Owen K.C. Stephens has obviously left the more experimental pieces for this expansion, nut unlike the book on the barbarian, the talents herein feel more inspired, more unique and more streamlined than the expansion for the barbarian. While I do think that the edges and talents herein can be used to craft deadly rangers indeed, I failed to make anything truly broken – and e.g. the ability-disable strike requiring prior knowledge of a monster’s capability rewards the good ole’ “The more you know…”-G.I. Joe trope and is something I really like. Overall, that’s the gist – the options are powerful, but damn cool and often just…interesting and uncommon. Hence, my final verdict for this expansion will clock in at “only” 4.5 stars, still rounded up to 5, mainly because the options herein may need a bit of scrutiny from DMs, but are too neat to leave by the wayside.